From the words of Paoline Paoline, E. (2003). 'Taking stock: Toward a richer understanding of police culture', Journal of Criminal Justice 13: 199-214. 1 From the words of Paoline Paoline, E. (2003). 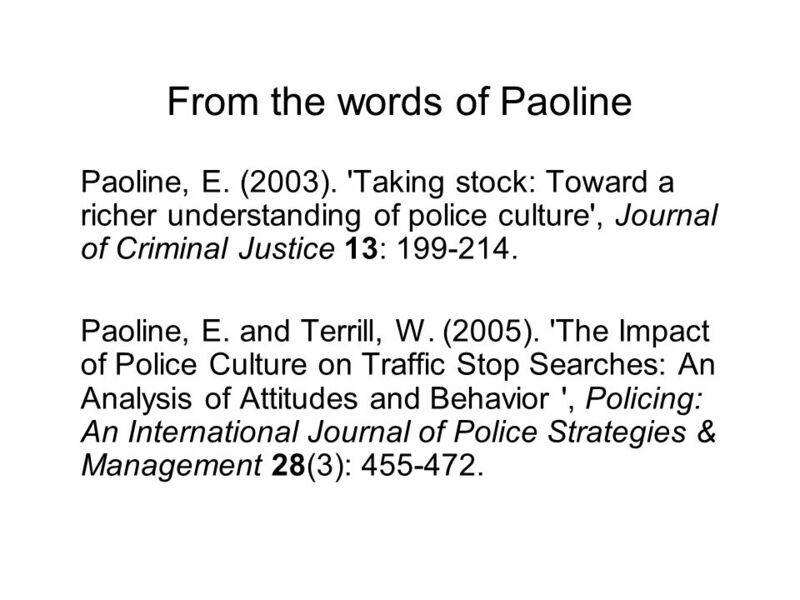 'Taking stock: Toward a richer understanding of police culture', Journal of Criminal Justice 13: 199-214. Paoline, E. and Terrill, W. (2005). 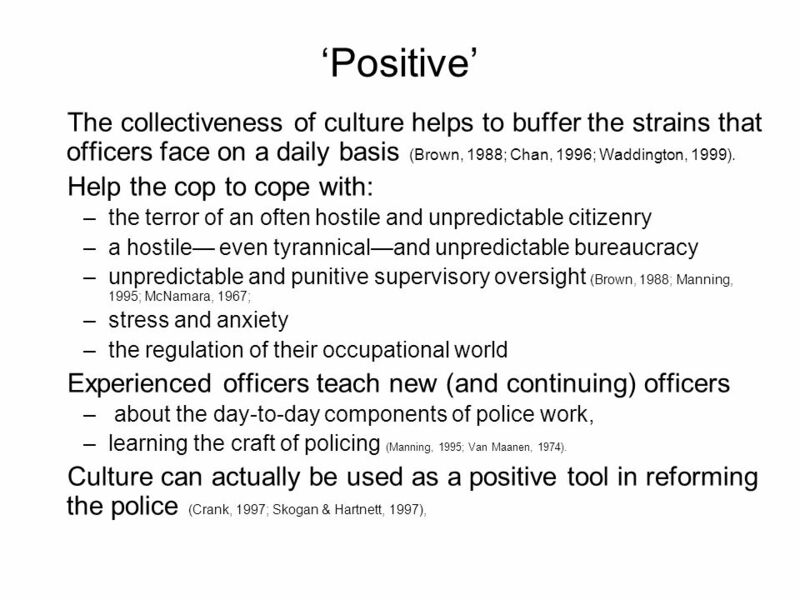 'The Impact of Police Culture on Traffic Stop Searches: An Analysis of Attitudes and Behavior ', Policing: An International Journal of Police Strategies & Management 28(3): 455-472. 2 Single Culture? 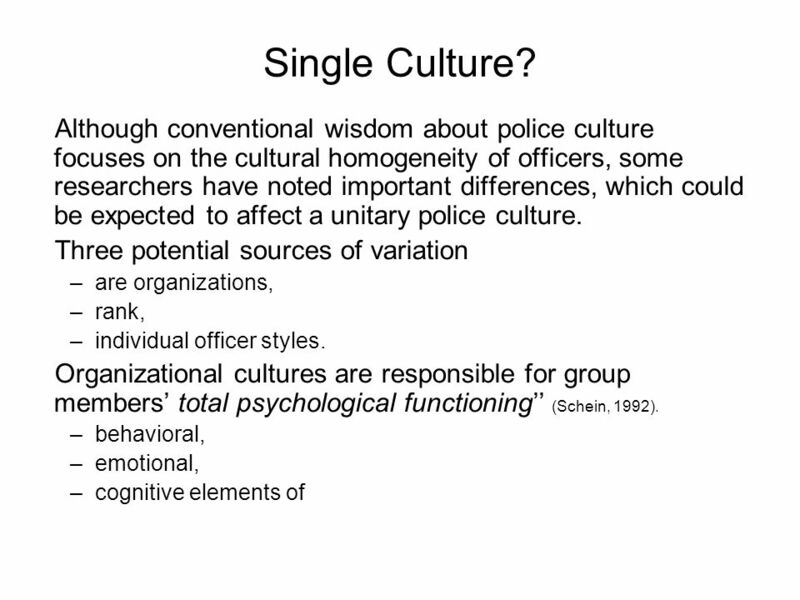 The notion of a single informal (occupational) culture has been endorsed by both past and contemporary police scholars. 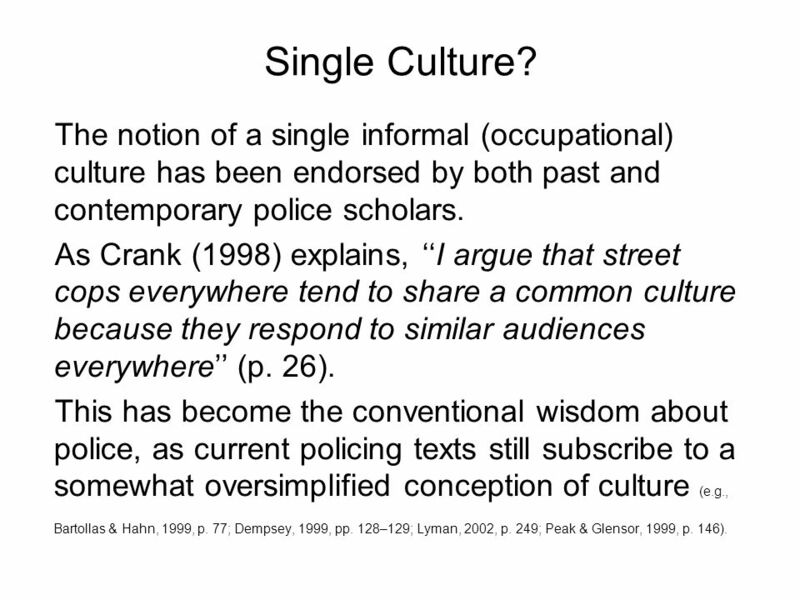 As Crank (1998) explains, I argue that street cops everywhere tend to share a common culture because they respond to similar audiences everywhere (p. 26). 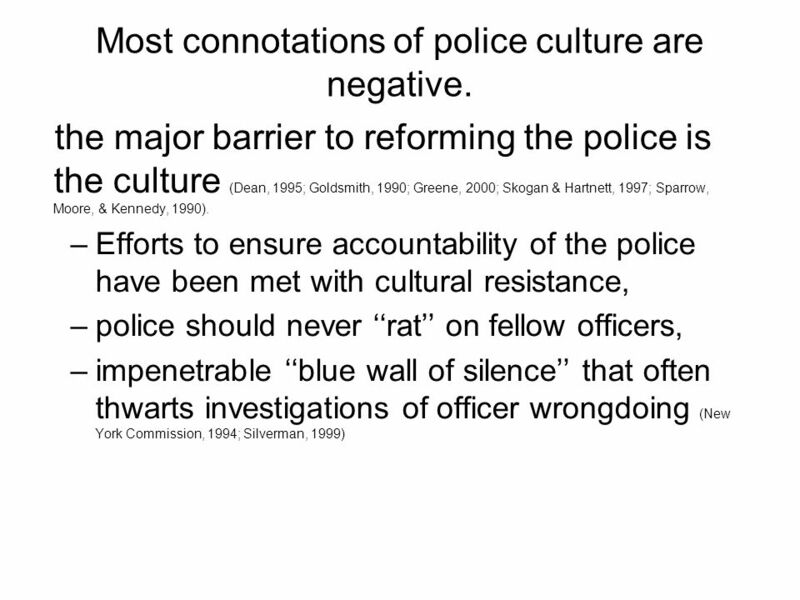 This has become the conventional wisdom about police, as current policing texts still subscribe to a somewhat oversimplified conception of culture (e.g., Bartollas & Hahn, 1999, p. 77; Dempsey, 1999, pp. 128–129; Lyman, 2002, p. 249; Peak & Glensor, 1999, p. 146). 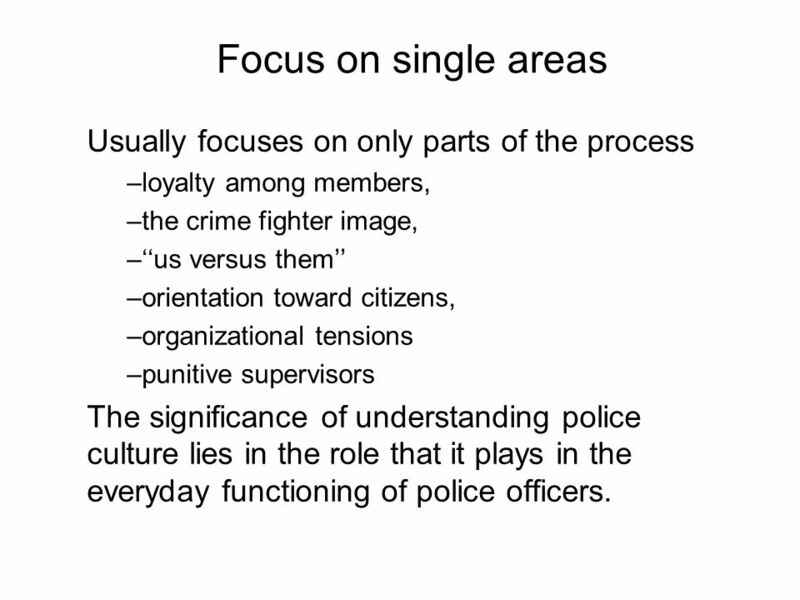 3 Focus on single areas Usually focuses on only parts of the process –loyalty among members, –the crime fighter image, –us versus them –orientation toward citizens, –organizational tensions –punitive supervisors The significance of understanding police culture lies in the role that it plays in the everyday functioning of police officers. 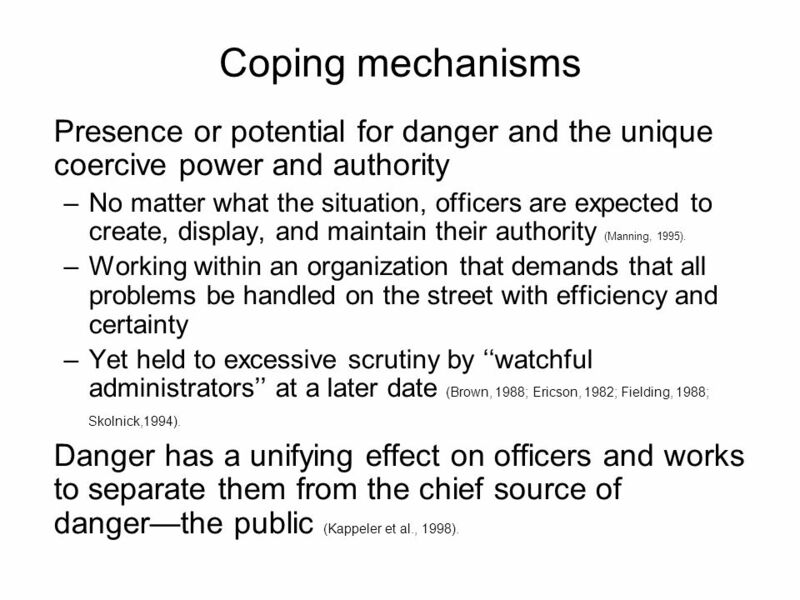 7 Coping mechanisms Presence or potential for danger and the unique coercive power and authority –No matter what the situation, officers are expected to create, display, and maintain their authority (Manning, 1995). –Working within an organization that demands that all problems be handled on the street with efficiency and certainty –Yet held to excessive scrutiny by watchful administrators at a later date (Brown, 1988; Ericson, 1982; Fielding, 1988; Skolnick,1994). 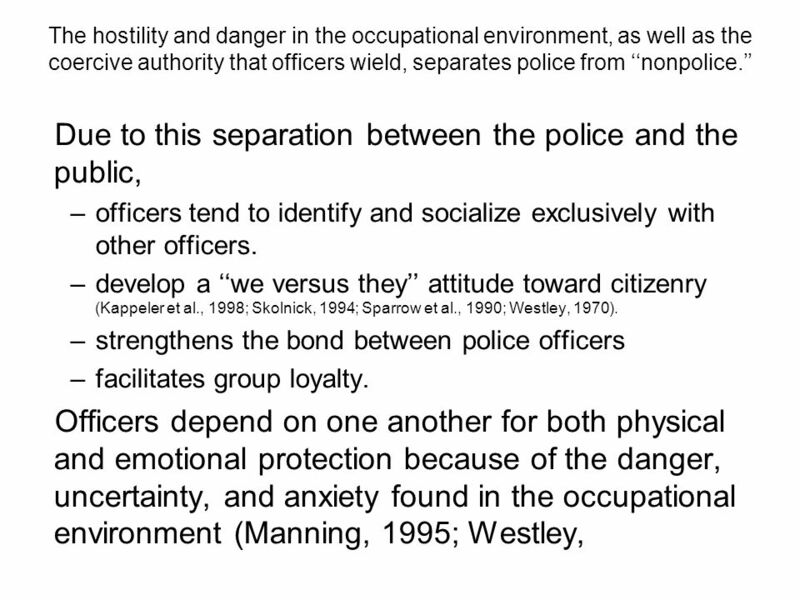 Danger has a unifying effect on officers and works to separate them from the chief source of dangerthe public (Kappeler et al., 1998). 8 Police are suspicious of the public Minimize the potential danger they confront, by displaying their coercive authority, –Always being prepared or one-up on citizens (Rubinstein, 1973; Sykes & Brent, 1980). 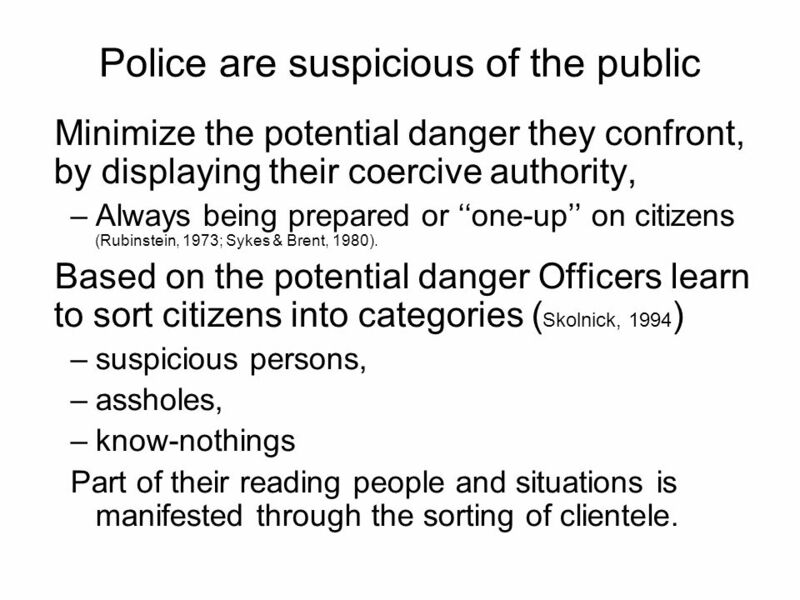 Based on the potential danger Officers learn to sort citizens into categories ( Skolnick, 1994 ) –suspicious persons, –assholes, –know-nothings Part of their reading people and situations is manifested through the sorting of clientele. 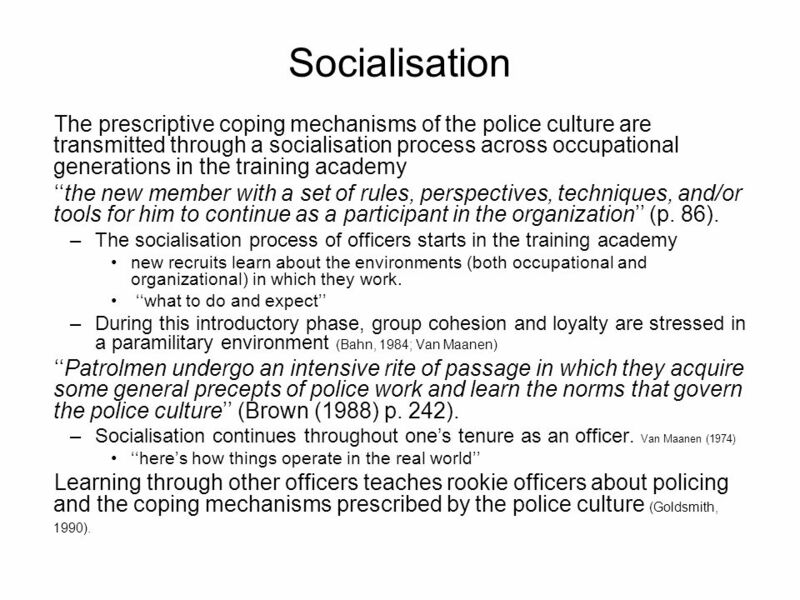 10 Socialisation The prescriptive coping mechanisms of the police culture are transmitted through a socialisation process across occupational generations in the training academy the new member with a set of rules, perspectives, techniques, and/or tools for him to continue as a participant in the organization (p. 86). –The socialisation process of officers starts in the training academy new recruits learn about the environments (both occupational and organizational) in which they work. 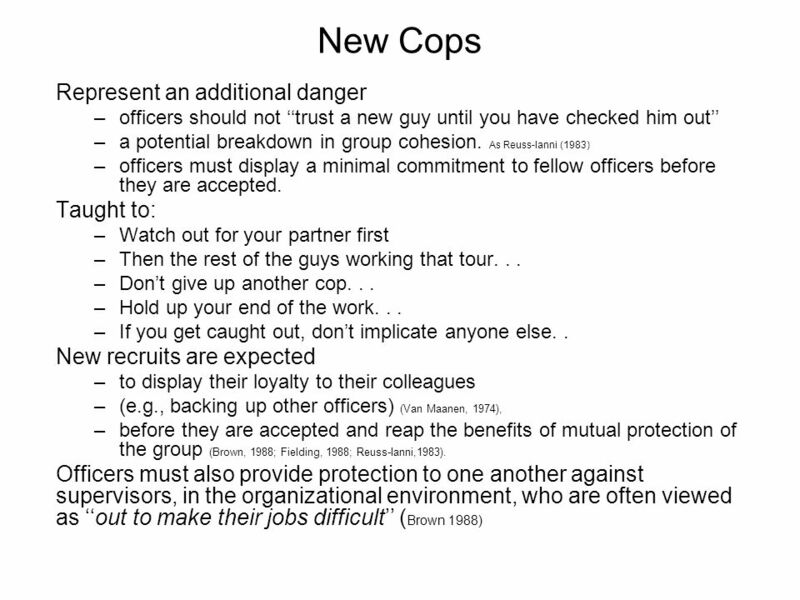 what to do and expect –During this introductory phase, group cohesion and loyalty are stressed in a paramilitary environment (Bahn, 1984; Van Maanen) Patrolmen undergo an intensive rite of passage in which they acquire some general precepts of police work and learn the norms that govern the police culture (Brown (1988) p. 242). –Socialisation continues throughout ones tenure as an officer. 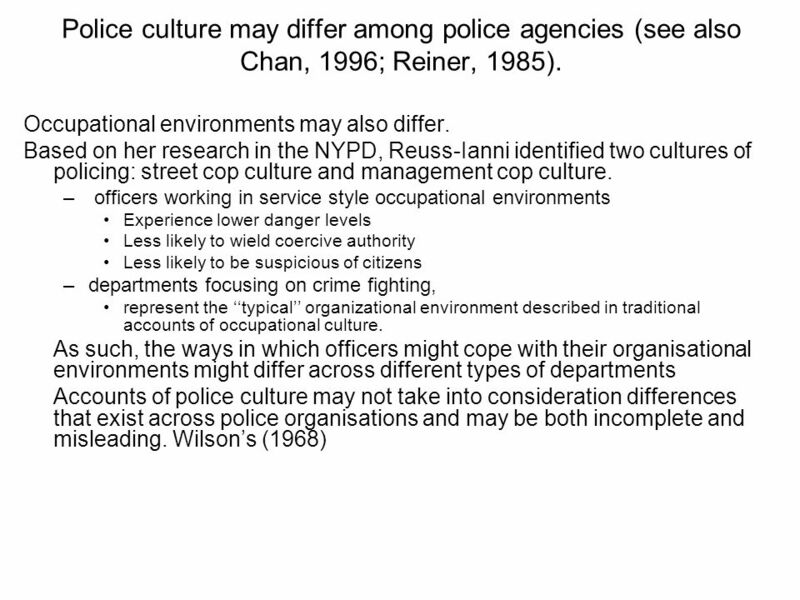 Van Maanen (1974) heres how things operate in the real world Learning through other officers teaches rookie officers about policing and the coping mechanisms prescribed by the police culture (Goldsmith, 1990). 11 Public The public is generally naive about police work... –basically unsupportive –unreasonably demanding –seem to think they know our job better than we do. 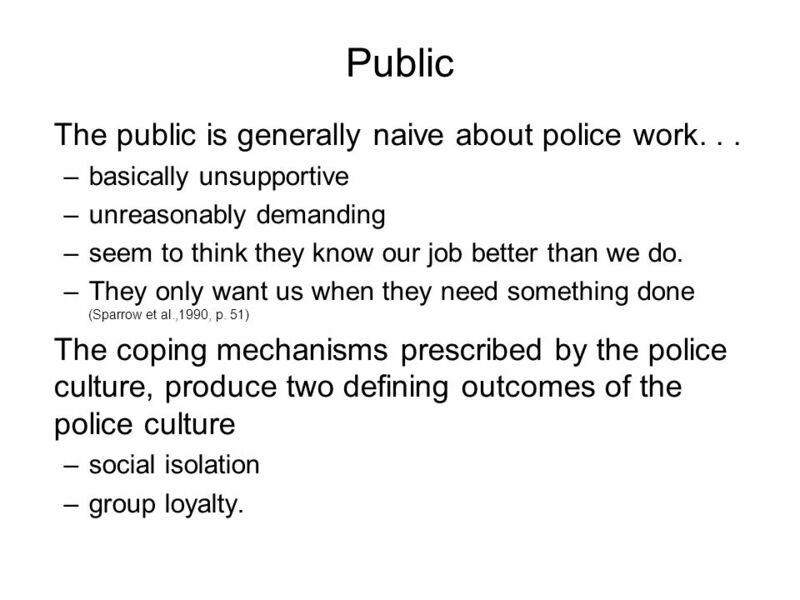 –They only want us when they need something done (Sparrow et al.,1990, p. 51) The coping mechanisms prescribed by the police culture, produce two defining outcomes of the police culture –social isolation –group loyalty. 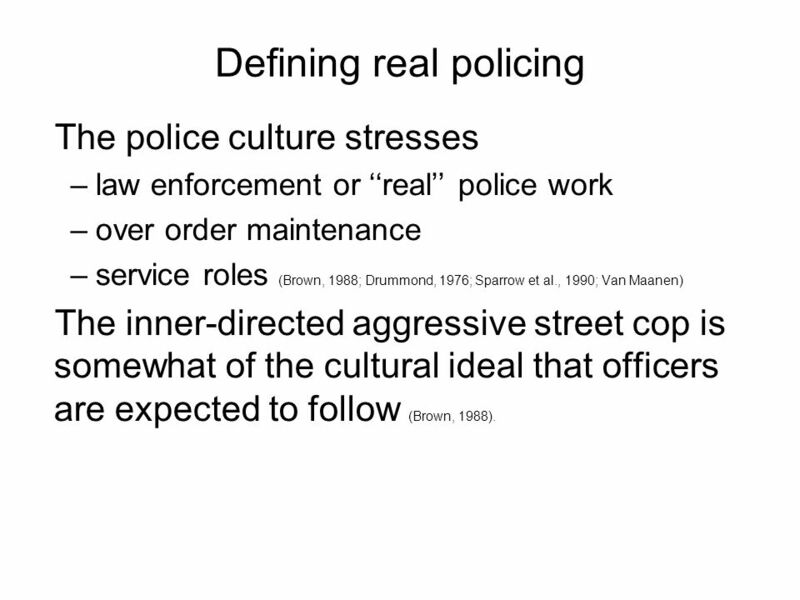 13 Defining real policing The police culture stresses –law enforcement or real police work –over order maintenance –service roles (Brown, 1988; Drummond, 1976; Sparrow et al., 1990; Van Maanen) The inner-directed aggressive street cop is somewhat of the cultural ideal that officers are expected to follow (Brown, 1988). 17 Two or more cultures? 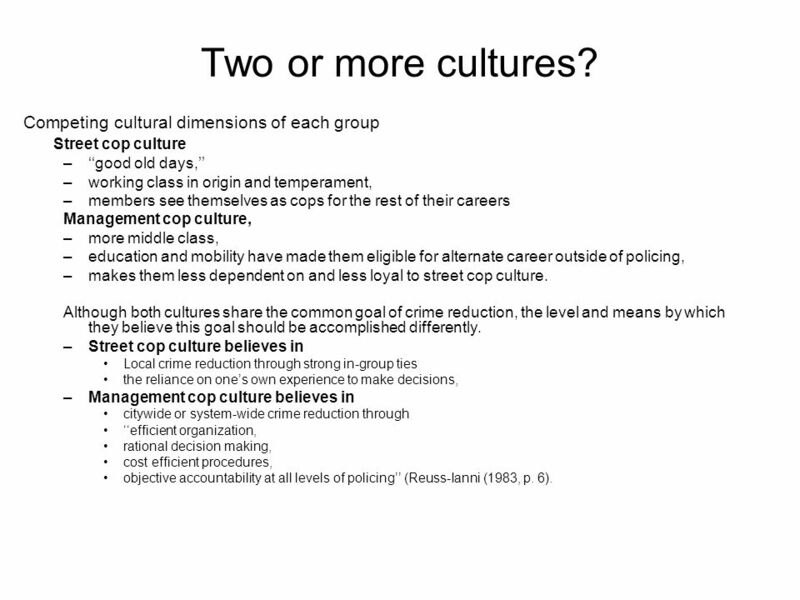 Competing cultural dimensions of each group Street cop culture –good old days, –working class in origin and temperament, –members see themselves as cops for the rest of their careers Management cop culture, –more middle class, –education and mobility have made them eligible for alternate career outside of policing, –makes them less dependent on and less loyal to street cop culture. Although both cultures share the common goal of crime reduction, the level and means by which they believe this goal should be accomplished differently. –Street cop culture believes in Local crime reduction through strong in-group ties the reliance on ones own experience to make decisions, –Management cop culture believes in citywide or system-wide crime reduction through efficient organization, rational decision making, cost efficient procedures, objective accountability at all levels of policing (Reuss-Ianni (1983, p. 6). 18 Three levels of each culture? 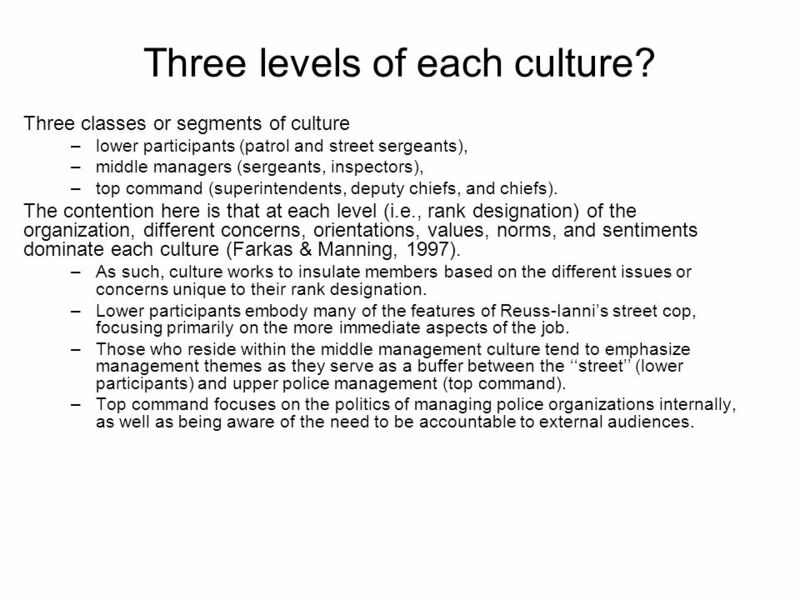 Three classes or segments of culture –lower participants (patrol and street sergeants), –middle managers (sergeants, inspectors), –top command (superintendents, deputy chiefs, and chiefs). The contention here is that at each level (i.e., rank designation) of the organization, different concerns, orientations, values, norms, and sentiments dominate each culture (Farkas & Manning, 1997). –As such, culture works to insulate members based on the different issues or concerns unique to their rank designation. –Lower participants embody many of the features of Reuss-Iannis street cop, focusing primarily on the more immediate aspects of the job. 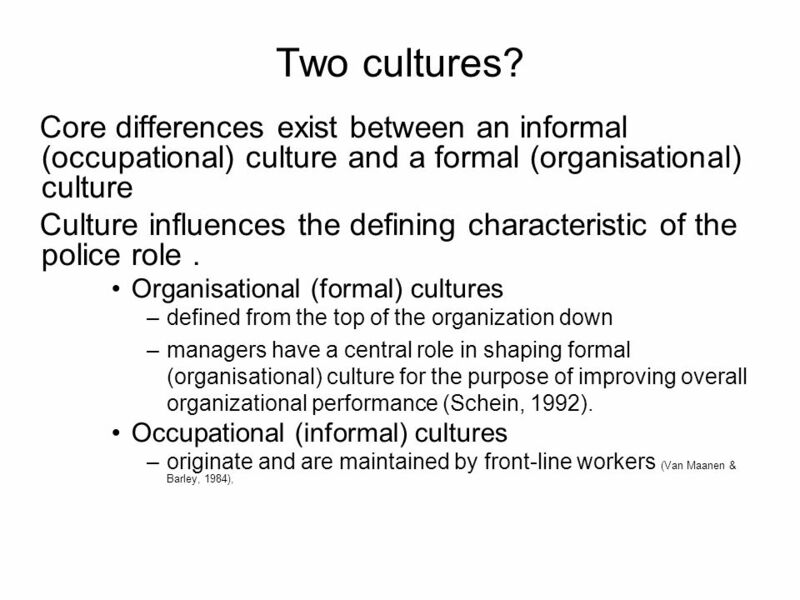 –Those who reside within the middle management culture tend to emphasize management themes as they serve as a buffer between the street (lower participants) and upper police management (top command). –Top command focuses on the politics of managing police organizations internally, as well as being aware of the need to be accountable to external audiences. 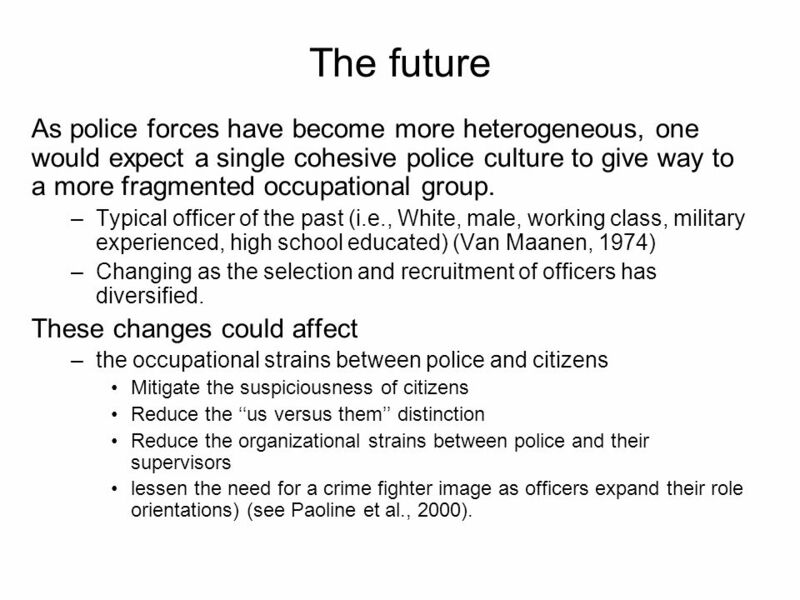 19 The future As police forces have become more heterogeneous, one would expect a single cohesive police culture to give way to a more fragmented occupational group. –Typical officer of the past (i.e., White, male, working class, military experienced, high school educated) (Van Maanen, 1974) –Changing as the selection and recruitment of officers has diversified. These changes could affect –the occupational strains between police and citizens Mitigate the suspiciousness of citizens Reduce the us versus them distinction Reduce the organizational strains between police and their supervisors lessen the need for a crime fighter image as officers expand their role orientations) (see Paoline et al., 2000). 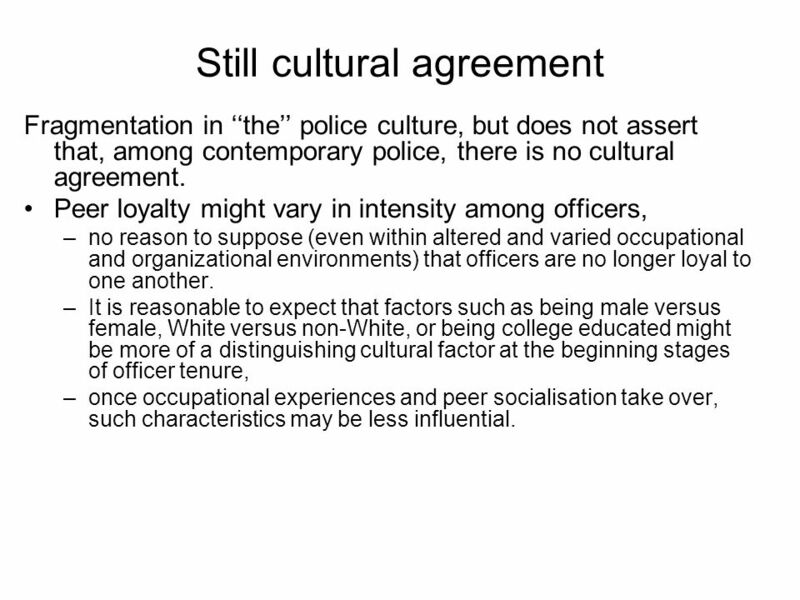 21 Still cultural agreement Fragmentation in the police culture, but does not assert that, among contemporary police, there is no cultural agreement. Peer loyalty might vary in intensity among officers, –no reason to suppose (even within altered and varied occupational and organizational environments) that officers are no longer loyal to one another. 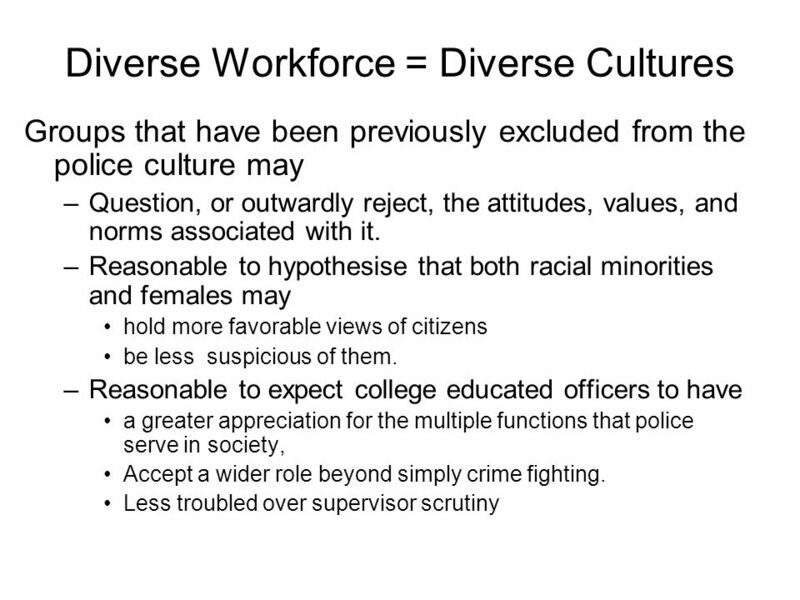 –It is reasonable to expect that factors such as being male versus female, White versus non-White, or being college educated might be more of a distinguishing cultural factor at the beginning stages of officer tenure, –once occupational experiences and peer socialisation take over, such characteristics may be less influential. Download ppt "From the words of Paoline Paoline, E. (2003). 'Taking stock: Toward a richer understanding of police culture', Journal of Criminal Justice 13: 199-214." Reforming an Garda Síochána Dr Vicky Conway Senior Lecturer in Law Kent Law School.  Answer.com- was “Ethics, in philosophy, the study and evaluation of human conduct in the light of moral principles. Moral principles may be viewed. © 2003 Wadsworth Publishing Co. Chapter 8 Social Process Theories: Learning, Control and Reaction Criminology 8 th edition Larry J. Siegel. Education -is teaching people about various subjects usually in school BASIC PURPOSE : TRANSMISSION OF KNOWLEDGE. Mainstream and Crosscurrents, Second Edition Chapter 7 Issues in Policing. Larry J. Siegel Joe Morris Northwestern State University Cherly Gary North Central Texas College Lisa Ann Zilney Montclair State. Chapter 6 The Police: Organization, Role, and Function. © 2005 Prentice Hall Inc. All rights reserved.16–0 Institutionalization: A Forerunner of Culture Institutionalization When an organization takes on a life.